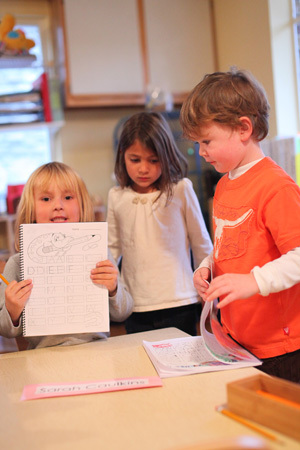 The Extended Primary/Kindergarten program is designed for the oldest Primary children at Children’s Garden. In this final year of the Children’s Garden program, children have developed confidence, a full foundation of Montessori early learning, a sense of accomplishment and serve as models for younger children. The Ex-P/Kindergarten children attend from 8:15 AM to 2:15 PM; they spend the morning in a mixed age primary class until lunchtime, at which time these oldest children from the primary classrooms join to spend the rest of the day together. This smaller group of just older children allows for more complex, advanced, age appropriate exploration of each of the Montessori areas. This cohort of older children often spend afternoons reading long chapter books out loud, taking walks and learning about the Cherry Creek neighborhood, as well as eagerly exploring reading, writing, mathematical calculations, geography, science and art. Five and six year olds enjoy working together, so we give them additional time in Zach’s Place so that they may collaborate on larger open-ended projects of their own design. To capitalize on the developmental benefits to both our oldest and youngest children at Children’s Garden we invite one Ex-P/K child at a time to assist in our toddler program. To join the Extended Primary/Kindergarten class, a child should be entering their Kindergarten year or 3rd year of the Primary program. Exceptions for younger children who are at least 4 1/2 years by August 31, have been in a Montessori pre-school program, and have a teacher recommendation may be considered for the class if space allows. Children who are 5 years old and those entering their third year of the Primary cycle have priority.